More chub on the plug. 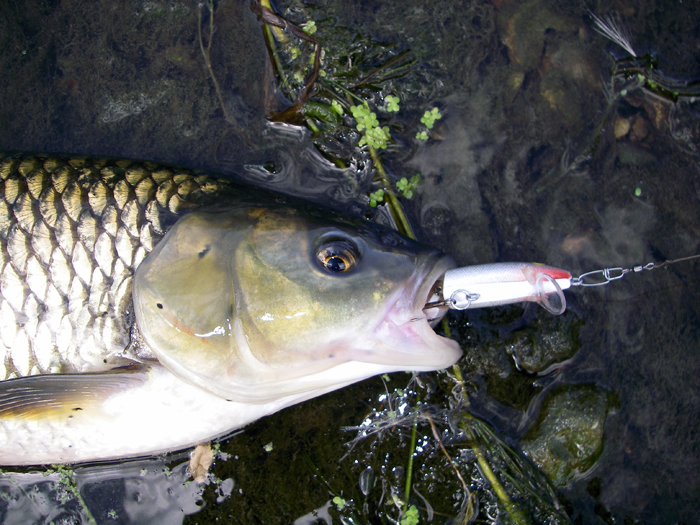 I really enjoy catching chub on lures and recently I've stuck to the little Rapala for my river fishing. I expect that the fish would take a bigger lure but the 9cm version casts a heck of a long way on my 20lb Nanofil. After the tangles I had at first with this line I seem to have the hang of it now but, like most very thin lines, it needs extra care to keep everything tight and tidy on the spool. Anyway I like it for this sort of fishing. My latest session started slowly and apart from a modest perch which took, jumped out and came off I had nothing at all for the first half hour. After a bit of a hike I reached a nice glide upstream of a cattle drink. I had to wade in to avoid the strands of barbed wire along the edge but in the past paddling about hasn't scared the fish. I made a few casts to my usual spots with no result and I was beginning to think that the chub were not at home. However, it looked really good so I decided to give the area a second go. My third cast was made straight upstream and the take came when my plug was almost back to the rod tip. A fierce pull suggested that it was a pike but it wasn't long before the big rounded dorsal fin of a nice chub appeared. I was well pleased. I took a couple of pictures before returning the fish. After a few more biteless casts I moved on to a shallow gravel riffle. 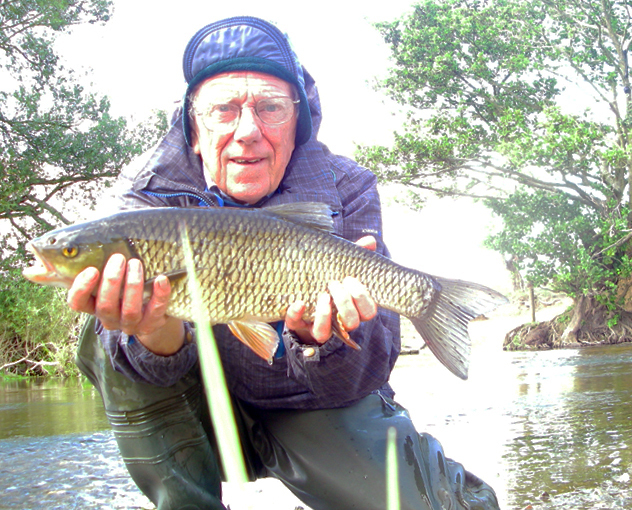 A long upstream cast produced a good take and the fish immediately took to the air. 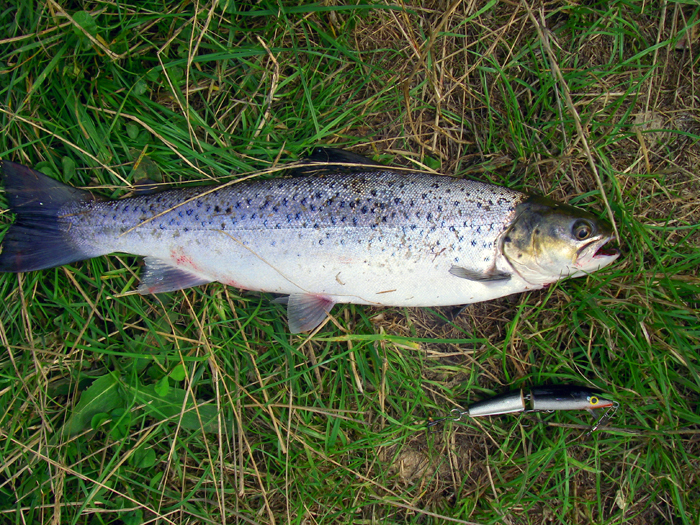 Seatrout! 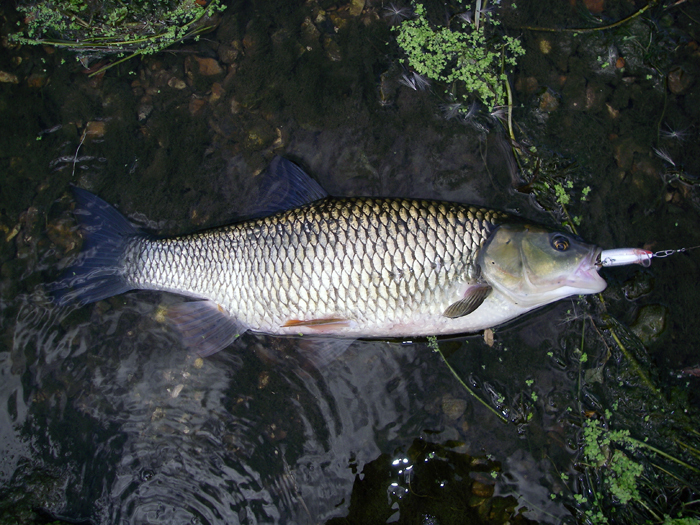 it was a bit livelier than the chub but I managed to land it and take a picture before slipping it back into the water. A nice way to finish.